"An Irish classic. Great for St. Paddy's Day!" 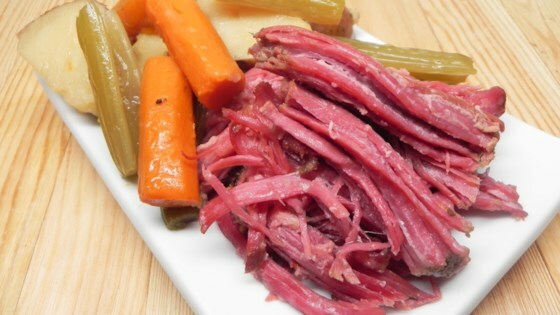 Place the corned beef into the bottom of a large slow cooker. Scatter the pickling spice over the brisket. Layer the celery, carrots, potatoes, and onion atop the brisket, respectively. Pour the stout beer into the slow cooker. Add enough hot water to the slow cooker to cover the brisket by at least 1 inch. Cook on High until the brisket reaches the desired consistency, 7 to 8 hours. Remove the brisket and vegetables from the slow cooker to a large bowl; cover with aluminum foil to keep warm. Remove 1 cup of the liquid in the slow cooker; pour into a small pot over medium heat. Cook the liquid until the volume is reduced by about half, about 10 minutes. Transfer the reduced liquid to a small bowl; stir the horseradish and sour cream into the liquid to make a sauce. Submerge the cabbage wedges in the liquid remaining in the slow cooker; cook until the cabbage softens yet retains some crispiness, 20 to 30 minutes. Remove the cabbage to a platter. Ladle remaining liquid from the slow cooker into a bowl. Slice the brisket across the grain. Serve with the vegetable mixture, cabbage, horseradish sauce, and liquid from the slow cooker. I would add the potatoes, carrots and celery after 4 - 5 hours of cooking time - they were overdone. The sauce of horseradish/sour cream added a great touch. looks easy and we are having a big dinner Wed.
Great, easy recipe. The corned beef was so tender and juicy.